At Lumendi we are dedicated to finding technological solutions that positively impact both patients and their doctors. Our medical devices are designed to help improve existing procedures and facilitate the development of new ones that will lead to improved outcomes for patients and lower costs to the healthcare system. Lumendi’s endolumenal interventional platform is designed to enhance and facilitate the diagnosis and treatment of colorectal disease through a less invasive approach. Balloon overtube technology designed to create a therapeutic zone within the large intestine, applied for FDA 510(k) clearance. Our core principles are focused on improving safety, reducing complications, and enabling new approaches to therapy, resulting in shorter hospital stays and a faster return to normal activity for patients. These surgical tools and clinical improvements will also provide economic value to the healthcare system as patients recover faster and return to their daily lives sooner. I am an independent medical sales rep in Arizona and am interested in working with or representing you company when it comes to the U.S. I have over 28 years experience in GI Endoscopy. Please contact me as to how you will be setting up your U.S. operations. Thanks so much for getting in touch with us. I will be passing on this information to the appropriate parties. And Yes, we are ramping up our sales team in the US. We are of course very interested in talking to you about your experience in the GI Endoscopy business. Please keep us posted how things progress. I sent you also an e-mail directly early this morning. Happy Holidays and all the best for 2017! I have informed our VP Sales Jim Soares about your interest. If you do not hear anything by Christmas, please drop me a line and I will follow-up to make sure somebody from our side got in touch with you. Thanks again for your interest in selling our DiLumen device. I am a gastroenterologist doing bariatric Endoscopy :POSE pro endure, Endomina procedure, révision of gastric bypass and endoscopic sleeve gastroplasty with overstich. Do you think in the future you can adapt your platform for stomach approach. Your platform is remarkable for colon endoluminal approach . I am interested to be updated. Thanks so much for your comment on our webpage. – Unless I understand what you want to exactly with the “stomach approach”, I have difficulty replying. However, if you can clarify I will then try to reply myself or get one of my colleagues to answer. – I appreciate you wanting to be kept updated. I have taken the liberty to subscribe you to our newsletter that will keep you updated how things progress. Anybody can do so right here, with their e-mail (click and subscribe). 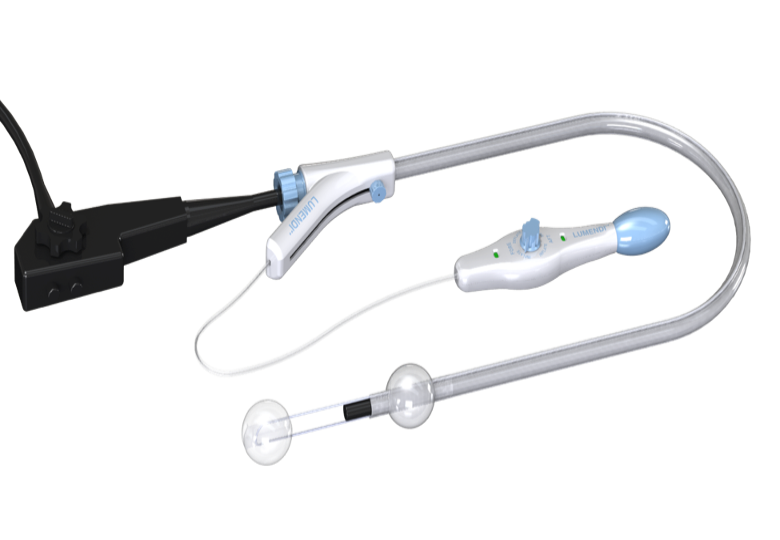 – What can be done with the device is described in our bruchure that you may want to download to get a better overview: Weill Cornell and Lumendi: Endolumenal Surgery. I hope the above is useful and I look forward to your reply. My father is 90 years old, obese, diabetic, and has been diagnosed with colon cancer. Talking to the surgeon, it is not clear that my father will survive the operation given the fact that laparoscopy might not be possible and a bigger incision might have to be made. Serious complications, like lungs collapse, healing of wound, etc.. makes the decision very difficult. I am writing to request your consideration to collaborate with our hospital Clinico San Carlos and our Dr. in Madrid and fly one of your experienced doctor to perform a Lumendi gastro-intestinal surgery on my father. We can afford the cost of the operation according to your brochure. We would be grateful if we could pay for your doctor’s fee and travel expenses. It would be a great opportunity for Lumendi to get your technology into one of the biggest and best hospital in Spain, as well as benefit my father from your technology that could save his life. Please, contact me at your convenience. Thanks so much for stopping by and leaving a comment on our blog. The situation you describe is a difficult one indeed. What makes it even more difficult is the fact that our technology is “licensed” for the USA only. That means, it has a 510 (k) clearance from the US Food and Drug Administration.. In other words, we still need to get the EU CE Mark before we can sell the device in Europe. Of course, the difference is that the EU CE Mark process requires medical device demonstration of safety only, and not efficacy as is the case in the US to get 510 (k) clearance. Nonetheless, so far we do not have EU CE Mark. To get the latter we must submit to one of the approved bodies in one of the EU Member States. We are all set to start clinical tests in the US during second half of January 2016. During these tests, doctors can and will remove polyps and so forth if they are found. But unless your dad can be included in these tests…. However, these tests occur in the US only. Unfortunately, we have not applied for the EU CE Mark so far. We are, therefore, not conducting any tests in Europe at this time. I am not happy to be unable to write you better news. But you know how to contact me and feel free to do so if I can be of any further assistance. PPS. Raising € 900’000 for the #Helpilayda campaign. Of course, I am not happy to say that we do not conduct any test in in Europe, thus none in Spain. Thanks so much for getting in touch with us. We also appreciate the thorough case report on your father. Traditional treatment (laparoscopic surgery) for malignant polyps in the elderly with other co-morbidities is a challenge and is something we hope to be able to address in a less invasive way with our technology. However, none of our presently scheduled studies will be looking at use of the DiLumen platform for endolumenal treatment of colon malignancy. Depending on the depth of the malignant lesion, an endolumenal approach to this polyp may not even be feasible. In the future we may look at attacking malignant polyps that meet certain criteria, but not at this time. We are initially looking at large adenomatous polyp removal (pre-cancerous) with the platform. Pilar, I appreciate your effort in getting in touch with us via the blog and doing research into treatment alternatives for your dad. Unfortunately, our our technology is not quite ready to be used in a study for case like this. In fact, if the cancer has spread, endoscopic treatment is not a curative option. I will discuss this case with our early investigators to see if they have interest in this case outside of a study, and will let you know if we have any further recommendations. Japanese gastroenterologists have the most experience with endolumenal treatment of early colon malignancy. I hope this information is useful to you. I have sent you email at (info@lumendi.co.uk) reageding my interests for a business opportunities with your company. Thanks so much for leaving this message. I sent you a reply of course… via e-mail. Please reply to this and we can take it from there. If you have not heard from us by March 15, please drop me a line. We try to reply to all inquiries as fast as possible. This fell between the cracks and for that I apologise.